Let Peter Pace himself out of his position | Jon Katz, P.C. This has been quite the scandalous month for the Bush Administration, with FBI dirty-spying-gate, fired U.S. Attorneys-gate, and now Joint Chief Peter Pace’s "homosexual activity is immoral"-gate. I look forward to hearing everyone who opposes bigotry and discrimination against gays — as do my law partner Jay and I — raise their voices against Joint Staff Chief Peter Pace’s recent pronouncement that homosexual activity is immoral. Mr. Pace certainly has the right to his opinion. However, I have been fully opposed both to Gulf Wars I and II, and am particularly not interested in having the U.S. military run by people with such views on gays as Mr. Pace’s. I do not think the First Amendment prevents government officials from being sacked or demoted rather than having people suffer from having their wrongheaded views put into action. 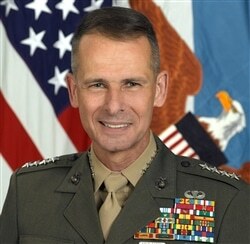 Mr. Pace’s public words against homosexual activity likely will be seen as a green light by many military decision makers and supervisors that they can more easily get away with discriminating against people they think are gay or who support gay rights, beyond the discriminatory "don’t ask, don’t tell" rule. (As far as I know, don’t ask, don’t tell does not apply to the legions of civilian military employees and employees of military contractors who depend on the military budget for their livelihoods). Consequently, it is all the more critical that George Bush II and Defense Secretary Robert Gates immediately go to the news media and reject Mr. Pace’s view that homosexual activity is immoral. Society needs to move more quickly towards fully respecting the rights of adults to engage in consensual sexual and romantic activity. Puritanism should not be imposed on the non-Puritan. Mr. Pace is not necessarily the only high-ranking military person with such strong views against homosexual activity. However, he has made his views known, and it is time to oppose them, and to hear George Bush II’s and Defense Secretary Robert Gates’s full opposition to those views. Jon Katz.